What is the Diversity Visa Program (Visa Lottery)? The U.S. Department of State makes approximately 50,000 annual immigrant visas (green cards) available for foreign immigrants who participate in the Diversity Immigrant Visa Program. Those who receive visas through the program are chosen at random by a computer program. For this reason, the Diversity Immigrant Visa Program is also referred to as the visa green card lottery. The lottery was established by the United States Congress’ Immigration Act of 1990 to diversify the ethnic and cultural demographics within the United States. The green card lottery does so by only accepting applicants from countries with historically low rates of immigration into the United States. In order to be eligible for the diversity visa program, applicants must be from an eligible country and meet strict educational or occupational requirements. Applicants for the program must submit their applications electronically during a small registration timeframe. The registration opening for the 2015 visa lottery (DV-2015) was began on Tuesday, October 1, and concluded on Saturday, November 2, 2013. Applicants must be natives of a qualifying country and must meet employment and education requirements to be eligible for the green card lottery. The purpose of the diversity visa program is to encourage immigration from countries with historically low U.S. immigration rates. Thus, if more than 50,000 U.S. immigrants have come from a single country over the previous five year period, then applicants from that country are ineligible to participate in the Diversity Visa Program. However, applicants from such countries may still qualify in two ways. If their parents were not born in the ineligible country, or did not reside in the ineligible country at the time of the applicant’s birth. The applicant’s parents must also have been natives of an eligible country. Two years of work experience at a job that requires at least two years of experience or education. If prospective applicants cannot meet either the education or work requirements, then they are ineligible for the green card lottery. Eligible applicants must submit their DS 5501, also called the Electronic Diversity Visa Entry Form (E-DV entry form), electronically at the Department of State’s diversity lottery website. This form collects biographical information, including the applicant’s name, gender, birth place, country of citizenship, marital status, and contact information. Diversity lottery applicants must also provide a digital photograph of themselves with their application. No fees have to be submitted with the application. Applications can only be submitted during the annual time period chosen by the Department of State. The 2014 registration opening has already closed, and the opening for 2016 has not yet been announced. The applicants must check the Department of State’s website to find out when the winners of the lottery are announced. 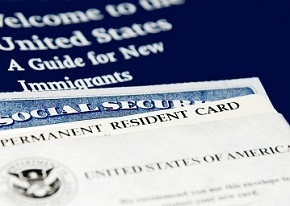 Immigrants who are granted diversity lottery visas (DVs) receive permanent resident cards (green cards), which enable them to permanently live and work in the United States. The spouse and children of those granted diversity visas can also apply for green cards so that they can also immigrate to the United States.